GERD or gastro esophageal reflux disease is a chronic illness that is characterized by flowing up of stomach acid to your esophagus, resulting in irritation of the esophageal lining. If not treated, GERD may result in more serious medical illnesses such as disorders of sleep. According to estimates made by the National Sleep Foundation, acid reflux is among the common causes of disturbed sleep in adults aged between 45 and 65 years. Heartburn at night affects 4 out of 5 individuals who get regular acid reflux and heartburn. 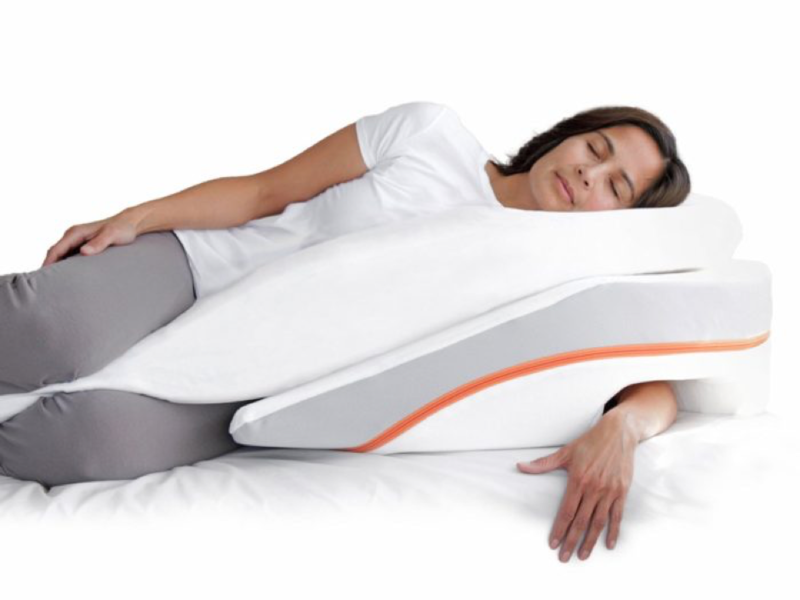 Sleeping on a specially designed, large wedge-shaped pillow is an effective way to manage sleep problems related to acid reflux. These types of pillow keep your position partially upright preventing the regurgitation of acid to the esophagus. It also limits positions of sleep that can put pressure on the stomach worsening symptoms of reflux and heartburn. Sleeping on the left side helps in reducing symptoms of heartburn occurring at night. Keep in mind that right is the wrong side to sleep on. When you lie flat in bed, your stomach and throat lies at same level, thereby, it is easier for the acids from the stomach to flow into the esophagus resulting in heartburn. However, when you sleep with the upper body raised, this does not happen. You may elevate the upper body by putting four to six inch blocks under the head of the bed or by sleeping on wedge-shaped pillow (at least six to ten inches thick at one end). Don’t use regular pillows as they just elevate the head and not whole upper body. How to sleep with acid reflux? Wear what’s comfortable for you. Tight fitting clothes, particularly around your waist may put pressure on the stomach, worsening the symptoms of heartburn. Some of the common drinks and foods that may trigger symptoms of heartburn and may disturb your sleep are alcohol, caffeine containing beverages such as tea, coffee and colas, cocoa and chocolate, garlic, peppermint, onions, milk, spicy, greasy, fried or fatty foods and acidic foods such as tomato or citrus products. Maintain a food journal to keep track of foods which may trigger symptoms of heartburn. Eat your meals at least 2-3 hours before going to bed at night to decrease stomach acid. It also allows the stomach to empty its content partially before you fall asleep. Since larger meals may place pressure on the stomach, eat smaller meals. More acids in the stomach are produced when you eat quickly and feeling stressed. Relax while eating and also after having your meal but don’t lie down. You can also try relaxation techniques such as mediation or deep breathing. Chewing sugarless gum helps in producing saliva that may soothe the esophagus and washes down the acid back into the stomach. It also neutralizes the stomach acid. Smoking may increase the stomach acid and also the risk of heartburn. In case you are unable to quit the habit of smoking, try to avoid smoking at least 2 hours before going to bed to avoid symptoms of heartburn or acid reflux. How to sleep with acid reflux? This remedy decreases the risk of stomach acid regurgitating into your esophagus. You should also avoid bending or lifting heavy objects. Symptoms of heartburn or acid reflux get worse when you put on weight, and losing even a few pounds (as little as 2-1/2 pounds) may help in reducing the symptoms of acid reflux at night. Certain medicines may worsen or even cause acid reflux including some drugs for osteoporosis, NSAIDs, some drugs for heart disease and blood pressure, some asthma medicines, some hormone medicines, and some medicines for depression. Discuss with your physician regarding any medicine you may be taking that is triggering your symptoms of heartburn. You can use OTC antacid to neutralize stomach acid and reduce symptoms of acid reflux. However, you should not use these drugs for more than 1-2 weeks and if symptoms do not improve after their use for 2 weeks, it is recommended to visit your physician. Drink ½ cup of organic juice of aloe vera 1-2 hours before going to bed. Aloe Vera helps in reducing inflammation and in neutralizing the stomach acid. Drink apple cider vinegar (organic) mixed with water 1-2 hours before going to bed. Mix 1 tbsp of ACV in 6 oz of water. By this method your body uses the acid sensors to stop the production of acid in the stomach. Eat an apple 1 hour before going to bed. An ingredient called pectin present in the apple’s skin acts as a natural antacid and helps to reduce the production of stomach acid. Drink fennel tea, chamomile tea or ginger tea 1-2 hours before going to bed. Ginger tea has natural anti-inflammatory properties, which help in soothing the stomach and relieving nausea. You can either use ginger tea bag or grated fresh ginger (1 tsp). Add fresh ginger (grated) to boiling water. Steep for 5-6 minutes. Strain. Fennel tea is also good for reducing stomach acid. Crush 1 tsp of fennel seeds and add to one cup of boiling water. Chamomile tea has anti-inflammatory properties and helps in soothing your stomach. Mustard has anti-inflammatory properties and it also neutralizes stomach acid. You can drink mustard by dissolving it in water 1 hour before going to bed or consume 1 tsp of mustard with water. How to sleep with acid reflux? You can take slippery elm (around 3-4 oz) or 2 tablets 1 hour before going to bed. It helps in soothing your stomach. You can dissolve 1 tsp of baking soda in 6 oz of water and consume it 1 hour before going to bed. Baking soda helps in neutralizing the stomach acid and relieving symptoms of heartburn and acid reflux. Acid Reflux: When Should You Visit Your Physician?